Roberta Warshaw Art and Design: A Great New Photography Book! A Great New Photography Book! 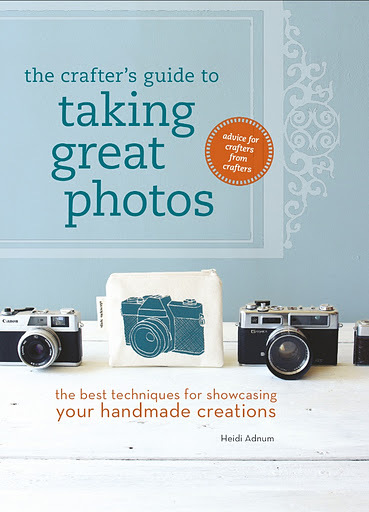 A few weeks ago I received an e-mail from Interweave to pre-order a book from them on photographing your work for art shows and online sales etc. The book is called "The Crafter's Guide to Taking Great Photos. "by Heidi Adnum. Many of you already know that I am a bit of a book-aholic. This combined with a serious need to learn the best way to photograph my jewelry, compelled me to order the book right away! I am happy to report that I got the book today, a bit earlier than the scheduled release on January 10th, and it is fantastic! The book is written especially for people like me who have very little experience with product photography. Even though I am still learning it has been a long, slow road. My photos need help! The photos in the book are all wonderful examples of good product photography. Underneath each photo the caption tells you exactly what type of camera was used to take the photos as well as the aperture settings, the f-stops, and ISO speed. In some cases even the time of day the shot was taken. I don't know of any other photography book (and I own quite a few) that explains it so well. Each chapter deals with a particular type of artwork or craft. There are ideas for when to use props and when not to as well as how to light your work to its best advantage. There is a ton of information packed into this book about how to make your own seamless as well as what time of day and where to take your photos. Inside or outside, neutral backdrops or colored. I did learn from reading the book that a big window is a great place to take your product photos. I do have a perfect window in my bedroom so I am going to get out my tripod and get busy! There are also some great interviews with the artists whose work is used to illustrate the techniques as well. If you are in need of more information on how to improve your photos I really recommend this book. I do still have a photography class coming up at Metalwerx in January that I am really looking forward to as well. Between this book and that class I am hoping to improve my photos, which in turn can hopefully help my sales. Thanks for the book review! I am going to make a note of it and do shoutouts of this post. So pleased that you're finding the book so useful, Roberta! Thanks for sharing. Thanks for the tip on this book. I will look for it too. Thanks too for the comment on my blog. I shared it with a lady yesterday ... someone with whom I'm corresponding. She's an art quilter ... though she doesn't have a blog and only two images pop up with a "google image search". She disagrees with the entire statement ... citing all sorts of things ... that tend to prove Chuck Close's quotation even more in my mind. It is nice to hear that other artists, serious artists, appreciate the wisdom ... the ones who seem to have "something" to show for the hours they put in at their craft! Preview Party and Trunk Show Tonight!